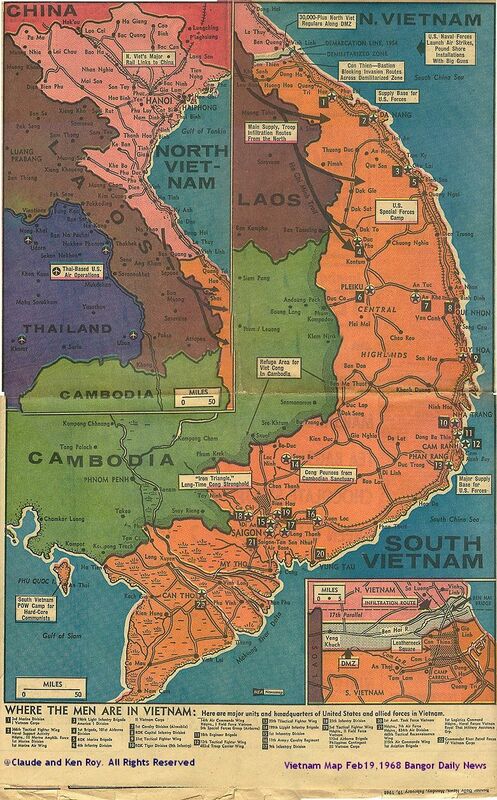 The following map of Vietnam was published in the Bangor Daily News on February 19, 1968 and saved by Mom. It is being presented here in tribute to all who served in Vietnam and to those who gave their all for their country. When you mouse over the names, the popup display will return the major military units that were in those locations in early 1968 based on information shown in the Bangor Daily News. I have added additional information based on personal knowledge on where the units were at other times and on relatives and friends who served in those units. First names only are used to protect their privacy. Some of the popups have links to other web sites for military unit information. If the arrow pointer changes to a hand pointer, you can click to get additional information. If you have information on where some of the units were when you served with them, please let me know using the Contact Us link at the bottom of the page. Thanks. Ken. The map is featured in the October 2008 issue of Reader's Digest article 4 Ways of Looking at a Map. For some very good detail maps of specific areas see Ray's Map Room. See also the 1968 Vietnam maps (entire Southeast Asia) that Richard Rooker provided to the Vietnam Veterans web site. The following Vietnam Wall memorials provide tribute to our Fallen Heroes, without having to visit The Wall (Vietnam Veterans Memorial Wall) in Washington, DC: The Virtual Wall and the Interactive Vietnam Veterans Memorial.